It’s always interesting to hear the recorded version of songs you’ve seen live. Sometimes it’s a disappointment, sometimes it’s an improvement. Much of the time, it’s definitely a different animal than you hear in concert -- it’s not often you run across a band that reproduces their live sound in a recorded format. 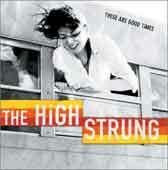 However, These Are Good Times, the newest album by The High Strung, is a strange thing. Although it’s not an accurate representation of their concerts, it’s nevertheless a catchy, solid album. But let me step back a minute. I’ve see the High Strung (who hail from Detroit originally, but apparently now call Brooklyn home) several times in concert. Live, they are a powerful garage-y rock band that still manages to convey an almost psychedelic quality in their melodies and singing. In fact, in concert, I’m not really sure who or what to focus on. Should I watch bassist Chad Stocker bang his head while managing to carry so much of the music? Should I focus on the alternating vocalists Mark Owen and Josh Malerman? Or should I just settle back and be impressed by the way Derek Berk beats his drumkit into near oblivion? Either way, I’ve found The High Strung's concerts incredibly energetic and compelling. So when I popped in my copy of These Are Good Times I was expecting a very solid garage band, firmly ensconced in the same musical vein as groups like The White Stripes or any one of those “garage is going to save music” bands. However, that’s not exactly what I heard. And that’s not a bad thing. For instance, the first song Wretched Boy begins with hard guitar riffs and drums, and a slight scream from vocalist Josh Malerman. However, it quickly moves into more poppy territory with the chorus and the most singing bassline this side of The Rock*a*Teens' Black Metal Stars. In contrast, The World’s Smallest Violin veers into a slightly more 60’s psychedelic territory with its slower rhythm and dominant, near-martial drum riff topped by the band chanting “It’s alright; it’s alright” backed by a wave of guitar feedback that washes over the listener. Furthermore, the exceedingly short song The Songbird begins with an almost orchestral organ bit which flows into a slow ballad highlighted by the Phil Spector-like wall of sound that builds throughout. In a similar vein, the two standout tracks of These Are Good Times aren’t exactly the straight-up garage-y rockers you might expect based on The High Strung’s reputation. The first one, Show a Sign of Life, is such a clever reproduction of a psychedelic/mod song that it had me (as well as at least one of my friends) thinking it was a cover of a song by The Creation, or one of those bands. However, what makes it particularly noteworthy is the way singer Mark Owens manages to deliver the happy, bouncy lyrics with an almost Johnny Rotten-esque sneer. Furthermore, this song demonstrates some nice mixing work, in which all of the instruments (most particularly the bass) come through clearly, but yet are isolated at the same time. Likewise, Throwaway harkens in my mind to The MC5 (which perhaps shouldn’t be surprising, considering The High Strung’s Detroit roots) with its screaming vocals and blistering speed. However, you might expect this song to be some sort of socio-political rant, it instead turns into a type of love song with the chorus of “You know it makes me sore. I will always love you more.” And this perhaps is the hidden strength of The High Strung: they know how to write a catchy phrase as well as how to construct a catchy song. The only complaint I really have about These Are Good Times is that, towards the end of the album, some of the music starts to run together. However, when you have a band which seems comfortable in its musical identity, you’re not likely to find an album which goes all over the map, but instead stays within its own measured confines. So I guess in the end, this is an album which more than meets my expectations. It’s not exactly like the High Strung’s concerts, yet in many ways this is more accomplished product that really brings out the melodic and somewhat psychedelic qualities of the band.